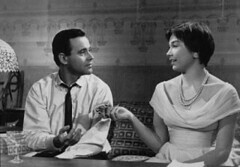 A writer-director before that hyphen became commonplace, Billy Wilder is responsible for some of the best and most well-loved American films in history, including Some Like it Hot, Double Indemnity, Sabrina, and my personal favorite, 1960’s The Apartment, starring Jack Lemmon and Shirley MacLaine. Although it won the Academy Award for Best Picture in 1960 (the last completely black and white film to win), and sits at #80 on the American Film Institute’s list of the top 100 American films of all-time, I get the impression that it’s not nearly as well-known as the vast majority of the other films on the list. The plot concerns C.C. Baxter (Lemmon), a young number cruncher at a big insurance company. A dedicated career man, he has lately taken to lending the use of his apartment to managers and executives in need of a safe place for extramarital trysts. Although it can make his life a bit hectic, he takes it all in stride, confident that the venture will help him rise in the ranks quickly, which will then aid him in gaining the affection of Fran Kubelik (MacLaine), a sunny elevator operator he’s had his eye on for a while. When the CEO, Jeff Sheldrake (Fred MacMurray) finds out what he has going on, Baxter gets called into a meeting. After a stern monologue from Sheldrake, it eventually surfaces that Sheldrake does not want to fire Baxter, but rather promote him, and have broad access to the apartment. Baxter agrees, unaware that Sheldrake’s mistress is in fact Miss Kubelik. When Baxter discovers this, the movie shifts. 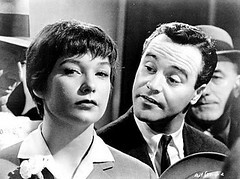 Sheldrake confides in Baxter that not only does he really not care for Miss Kubelik very much, but that he has a long history of affairs, and in each case he strings the woman along, making her think he intends to leave his family for her, never really intending to do such a thing. Then on Christmas Eve, without knowing that his secretary alerted Fran to his philandering history, Sheldrake gives her a story about how it’ll be a while before he can leave his family for her. She starts to see through his lies, and, tearing up, states matter-of-factly, “You think I would’ve learned by now. When you’re in love with a married man, you shouldn’t wear mascara.” He gives her $100 as a Christmas present, and leaves. Baxter comes home to find her passed out on the bed, having taken a bottle of sleeping pills. That’s good advice, but not good enough. Yes, Baxter needs to “man up”, but as Christians, we know that it’s being human that gets us in trouble in the first place. As humans, we are incapable of the perfection Christ calls us to in Matthew 5:48. “I’m so fouled up,” Fran tells Baxter. She’s also halfway there. We’re all fouled up, but Jesus isn’t, he loves us regardless, and by his grace we are forgiven. As we see in Baxter’s transformation, it’s never too late to grow up, take our sin seriously, and turn from it. The important thing is who you turn to. Don’t settle for being a mensch.